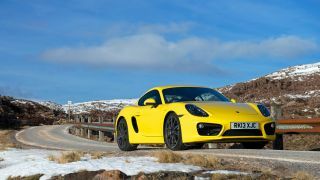 Porsche Cayman: perfect fusion of analogue and digital driving? Sports cars and technology. They're not always the best of chums. But if there's one car that might just be able to broker a peace between analogue and digital in modern driving, it's the all-new Porsche Cayman. Remember when audiophiles used to duel at dawn over the digital-versus-analogue debate? Something similar is happening between car enthusiasts on forums across the globe. As cars get ever techier, an anti-digital brigade seems to be building. These pro-analogue purists argue that the distance between man and machine – and in turn driving enjoyment - is growing ever greater. For those who embrace technology, that's just Luddite talk. Technology is making cars faster, more efficient and more effective than ever. It's progress and it's all good. Enter the all-new Cayman, a Porsche that might just satisfy both purists and the PlayStation generation. Firstly, that's because it's highly configurable. Want a bare bones Cayman with a manual gearbox and passive suspension? No problem. Prefer the full gadget treatment with a robotised dual-clutch transmission along with computer control for the suspension, engine mounts and differential? Just tick the boxes. But it's also because more than just about any car – this side of £100,000, anyway – the Cayman manages to meld tech with feelsome tactility and raw excitement. First, let's get the basics covered. For the new Cayman, codenamed 981, we're talking mid-engine in Porsche's classic flat-six configuration. That makes for a compact, low profile engine and a uniquely soulful soundtrack. With the new Cayman the base model shrinks to 2.7-litres from the 2.9-litres of old. But power is actually up very slightly to 270hp. The new model is also slightly larger. Despite that, it's around 30kg to 40kg lighter than before thanks to an advanced hybrid body and chassis construction that cleverly mixes steel with aluminium. Put it all together and you have a car that's faster and yet more efficient that its progenitor. The new 2.7-litre Cayman, then, is a 165mph sports car that's rated as low as 180g/km with the optional dual-clutch PDK gearbox. The 3.4-litre Cayman S ups the ante to 325hp and 174mph and just 188g/km. Impressive stuff. But what about the tech? The key technology options, in driving terms, are gearbox, suspension and driver aids. There are also a few nifty extras including an active rear differential and computer controlled engine mounts. On the gearbox side the obvious tech upgrade is PDK, which stands for Porsche Doppelkupplungsgetriebe or Porsche dual-clutch gearbox. It's basically a robotised manual gearbox but with two clutches. The latter detail allows for essentially seamless shifts as the dual clutches are used to allow almost simultaneous engagement of the new gear as the old is discarded. It's impossibly slick. Next up is PASM or Porsche Active Suspension Management. The shizzle here involves computer controlled dampers at each corner of the car. In practice that means you not only get a choice between two overall modes for the suspension, one biased towards comfort, the other firmer setting for handling. The system is also continuously regulating damping force according to road conditions and driving style. Finally, there's the broad subject of driver aids which adds another layer of digital enhancement but also brings all the other systems together and ensures they're all pushing in the same direction. For Porsche that starts with PSM or Porsche Stability Management. This system uses sensors that constantly monitor various parameters, including traction, yaw and lateral acceleration. In really simple terms, if the system detects the car sliding or generally attempting to escape the road and head for the scenery, PSM can correct it by applying braking force to individual wheels. You can enhance PSM, which is standard on all Caymans, but ticking the Porsche Torque Vectoring option box.